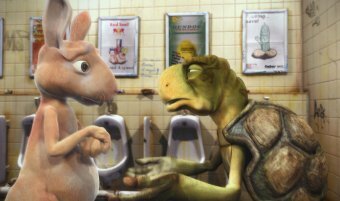 While using a public toilet, the hare Klaus is disturbed by a turtle who tries to sell him 15 boxes of soap by promising him it would be the solution to all of his problems... and succeeds. Alexander Kiesl was born in 1976 in Landau/Pfalz. He started a computer animation traineeship in 1998 and founded the company Unexpected Postproduction in 1999 in Stuttgart together with three other animators. From 2000-2005, he studied Animation and Visual Effects at the Film Academy Baden-Wuerttemberg in Ludwigsburg. A selection of his films includes: Mismatch (2000), Deadline (2001), Kampfpilot (2002), Curd Soap (Kernseif, 2004), and X-Box Racing Beats (2005), among others. Sebastian Stolle was born in 1979 in Sondershausen. After studying Visual Communication in Kassel, he enrolled at the Film Academy Baden-Wuerttemberg in 2000 to study Animation and Visual Effects. Also a freelancer at Unexpected Postproduction, his films include: Wahre Luegen (2000), Mata Aouze (2001), Fresh Rolls, The Search for the Ultimate Kick 2002), and Curd Soap (Kernseif, 2004).